Lessons that last are the lessons that are modeled, not the ones that spoken. 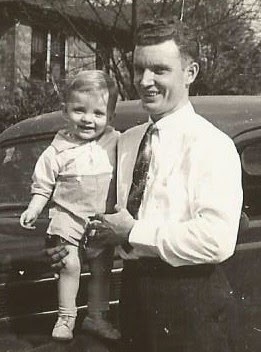 I know that today more powerfully than I've known it, which means, now, seventy years after that picture was snapped, I'm still getting a lot of the lessons my daddy modeled for me. One of those lessons came to me just before midnight last night. I was two and half miles into what ultimately became a seven and half mile run. I was running through downtown Huntsville, surrounded by the sounds of three live bands behind me and at least that many ahead of me when I heard the unmistakable sound of a Harley approaching from behind. As I ran, I snapped on my flashlight to mark my position. The bike slowed and I glanced to my right to make sure the rider had noted my presence. He turned toward me, waved his left hand, and above the noise of his unmuffled exhaust he shouted, "It is sure a great night night to be out." I waved back, and shouted my agreement, though I knew from experience he couldn't hear me. As I watched his taillights fade, I thought of motorcycles, and daddy, and then I thought of his first motorcycle and the day he got his second one. Then I laughed out loud, to the delight of residents of the retirement home who were sitting on their front porch watching the night and listening to the garbled music. 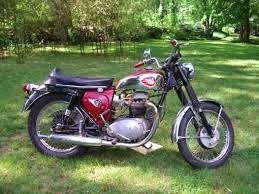 A couple of years after my 1960 graduation from high school, I got the bug for a Harley. Since I was living at home, the decision wasn't totally mine. I knew what mother would say, so I went to daddy. I explained that I wanted to trade my car, a 1954 metallic green Plymouth that I called Bullfrog, for a 1957 Harley Davidson Duo Glide that had just been traded in at the Harley shop in St. Augustine. He thought about that for a few minutes and then began naming all the reasons that a motorcycle as my sole means of transportation wasn't practical. I quickly agreed with every point he made because I had already thought of every one of them on my own. When he finished, he asked, "And you still want one?" "Yessir," was all I said. He smiled and said, "That's what I figured. Okay, I'll explain it your mother. Go ahead and put the deal together." Two days later, after the bike was delivered and Bullfrog was driven away, the two of us stood in the driveway admiring the bike for a long time. Finally I said, "You want to take it for a ride?" "No," he said, "I want to start with something a whole lot smaller than that." I didn't get that when he said it, but over the course of the next few weeks I remembered his words and thought secretly, I probably should have started with something smaller. A month or so later, I came home and found daddy washing his new Harley 165. As he lovingly cleaned the bike he explained that he had always wanted a motorcycle but his parents would not allow him to have one, and though he never forgot that, the time just hadn't been right for to get one... until now. I circled the miniature motorcycle a couple of times, stopped and looked at him, then said, "It looks a little small for you." He grinned and went back to washing the bike as he said, "It's small but it will do until I learn to ride." He "learned" for the next year, riding that little machine everywhere, in all kind of weather, despite the fact that it handled like a brick and the only way he could get it to sixty was to flatten himself across the fuel tank. Even that wouldn't work if there was the slightest headwind. Now I understand. He didn't care about that. He was learning to ride. A year later, early on a Saturday morning, I heard daddy kick Putt-Putt, as I had come to call it, into life. I ran from the house and caught him as he was strapping on his helmet. "Wait for me," I shouted above the noise. "I'll get dressed and go with you." He shut the bike down, then smiling he said, "That's alright. I have something to do. You go back to bed and we'll ride this afternoon." Back to bed sounded good, so I agreed. Before the sound of the tiny motorcycle had totally faded, I was back in bed. I had only been up a half hour or so when I heard a different sound from the driveway. A deep-throated bass with long intervals between each cylinder firing. I knew it was a big bike. I also knew it wasn't stock. And I knew it wasn't a Harley. I ran outside and stopped in my tracks when I saw daddy sitting astride his new BSA. Without shutting it off, he said, "Are you ready to go for a ride?" We left town on State Road 19 which passes through the Ocala National Forest. As usual, I was in the lead. At the beginning of a thirteen mile, absolutely straight stretch of road without a single house or side road, I glanced in my mirror and saw him take his hand off the handlebar and point straight ahead. I twisted the throttle to the stop and watched the speedometer wind past a hundred miles per hour and finally peg out on the Harley emblem at the bottom-center. I guessed that I was traveling somewhere in the neighborhood of a hundred and five miles per hour. I raised my hand to let him know that was as fast as I could go and then I glanced in my mirror and saw him approaching at a rate of speed I couldn't believe. As he passed, he shifted from fourth to fifth, and the front wheel of his big English bike lifted a few inches off the ground. I'm sure he was laughing but I couldn't hear it through the sound of the two engines. Last night, I finally got the lesson he modeled so elegantly all those years ago. Begin with the basics and stay with them until they are mastered them before you move on to all the bells and whistles. Yep, last night was a good night to be out with daddy.